Explore listings of current classes offered below. Check frequently for new listings and schedule information. In this class about techniques, explore many of the aspects of wire that make it exciting. We will also look at what inspires each of the participants and how it translates into the work. Students should be ready for a week of inspiration and techniques using wire as a fiber. Included in the class: twining, knitting, crocheting, color blending and use of a torch for preparing the wire. Using my unique method of color blending using copper wire for spokes, explore the use of fine colored wires as a twining material. Your Maple Leaf will glow when the light hits it. If desired twine in a sterling silver pin which will turn your leaf into a brooch. Twining skill is useful. This sweet little basket is perfect for you to imagine gathering the first flowers of spring. Explore twining with fine wire, blending color then making a handle to turn this into the basket for your dreams of spring. 2 3/4" x 1 3/4" x 1"
Twining is such a satisfying and relaxing way to make a basket. Why not do it with wire? 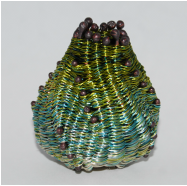 Using your own choice of color, learn color blending with fine wire. This small oval basket is a beautiful way to store your favorite earrings or ring. 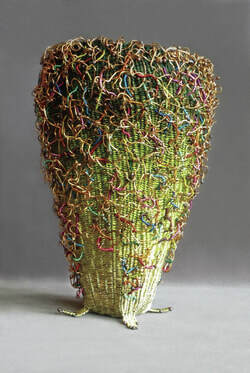 Using my unique method of color blending, using copper strips and copper wire for spokes, explore the use of fine colored wire as a twining material. Your “Jester” will glow when the light hits it, truly a work of art. One of the beauties of working with wire is that it can move and stay where you put it. Making this little basket will give you the opportunity to learn color blending and shaping as well as twining with fine wire. You make the basket twist as you add spokes. Using my unique method of color blending using copper wire for spokes, explore the use of fine colored wires as a twining material. Your Gingko leaf will glow when the light hits it. If desired, twine in a sterling silver pin which will turn your leaf into a brooch. Twining skill is helpful. Remembering the days of gathering dried milk-weed pods as a child, I will guide you on your exploration of that shape so that you can make it either into a brooch or a pendant. A miniature wire basket turned upside down becomes a very lovely pendant. Explore color blending and working on a small scale while twining with very fine wires. 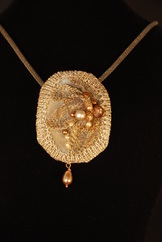 This graceful pendant is a piece of wearable art. Twining experience is helpful. Learn to twine and make miniature baskets on these little beauties. Shaping and blending colors is the focus of this class. 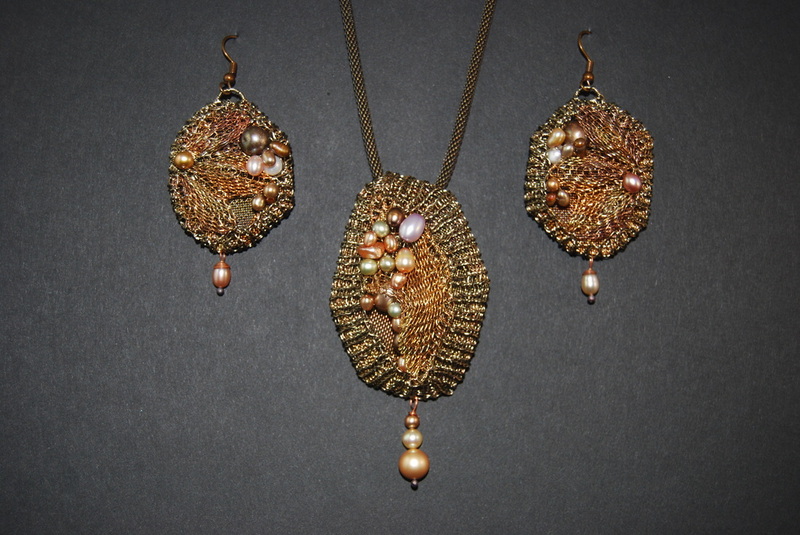 Attach your favorite beads to dangle beneath the discs to make this set very wearable. These asymmetrical earrings will please the eye as well as will teach you to twine with fine colored wires at the same time. Blending colors is also discussed. At the end of class you will have a pair of stunning earrings to add to your collection. With a selection of wire cloth and wire create a beautiful pendant. Learn to cut, hem and stitch onto the wire cloth. See how to receive amazing flashes of color with a torch on the wire cloth. Once the wire cloth is prepared, attach wire and knit and crochet to create your own design. Learn how to attach pearls and beads enhancing your pendant to produce a unique piece of jewelry. Students will receive three different 3” squares of wire cloth, copper, bronze and stainless steel. Learn how to cut, hem, corrugate and stitch on the wire cloth and see how to receive amazing flashes of color with a torch. Each 3” square can be cut to produce a pendant PLUS a pair of earrings.